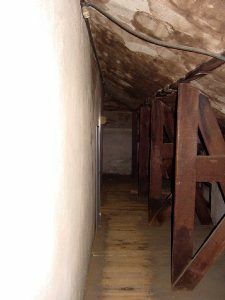 Under the eaves in the attic. It is here that the Monkey Face Boy often played. Notice the large orb at the back. By Kathy Weiser-Alexander. 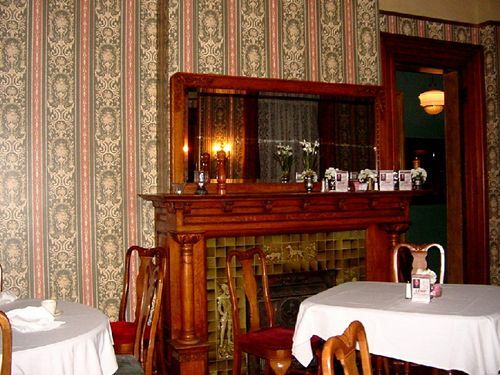 My name is Renee and I have family in St. Louis, Missouri, so when we visit, my husband and I, along with my brother and my cousin, make a trip to the Lemp Mansion when we’re in the area. Our last visit was on March 24, 2003. We arrived at the mansion around 8:30 p.m. to find out that a show and dinner party was in effect; however, we were told that we could look around on the main floor and upstairs. 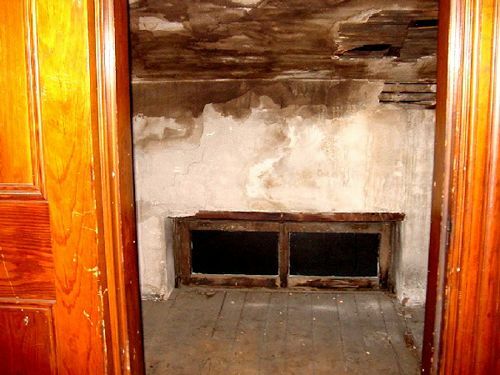 Neither my husband or myself had ever been in the attic, so that’s the first place we headed. Already creeped out because of the dark and silence, our group soon reached the end of the long hall, where the “monkey boy” was kept. However, as we turned around to leave, all four of us got instant chills when we heard a little boy say: “come play with me.” I told my brother to shut up, and he responded, “I didn’t say anything.” That’s when the boy repeated himself again. I then turned to my husband, saying the same thing to him as I had my brother and he said “that wasn’t me, its time to go.” That was the first encounter in my ten years of visiting the Lemp Mansion, and I hope there will be more. I’m fascinated with ghosts! For Thanksgiving, 2004, we’ll be making a trip to Missouri again, and hopefully, we’ll bring back good stories. 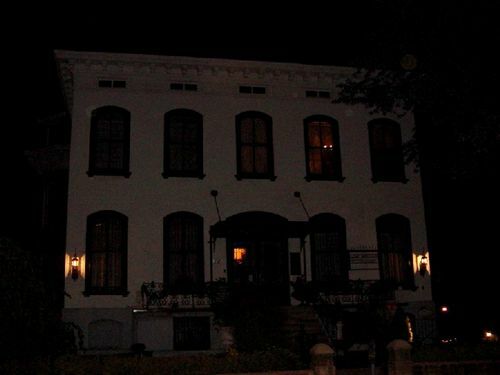 I visited the Lemp Mansion in January of 2003 with my aunt. We arrived in early and had lunch at the Lemp Mansion before checking out the sights of St. Louis. We, too, were shocked that we were given a key and told we’d be all alone that night in the mansion. We were the only ones staying there that night, mind you, but didn’t know this at the time. I assumed someone lived there and they meant alone as in no other guests. The hallway outside Charles Lemp’s room. Notice the large orb on his doorway. By Kathy Weiser-Alexander. I felt uneasy right away the second I got to the top of the stairs. My aunt seemed ok and wanted to explore, but I felt this heaviness. The hallway off to the left of the stairs was the worst. My body just would physically not go in that hallway! We had reservations at a comedy club that night, so we decided to take a nap. An hour into my nap, I awoke to the sound of a baby crying and a woman talking. I got a little irritated because it was right outside our room (we were in the big suite – the Lavender Lady’s room) and how rude it was of this woman to just stand up there and make all that noise! But then it stopped and I went back to sleep. When we got up, we found two women downstairs taking down the Christmas decorations and we got to talking to them. That was when we learned we were the only ones there that night and I asked the women to leave the light on in the dining room so it wouldn’t be pitch dark when we got in that night from the comedy club. The women told us their experiences and we laughed. Off-handed, I mentioned if they were the ones with the baby. I heard the crying at 5 pm and was told promptly there was no one else there but them after 3 pm and definitely no baby. I felt silly for even thinking I had heard such a thing and was convinced these women were trying to scare us. That night when we got back, we were alone. My aunt wanted to explore, but that uneasy feeling was overwhelming to me. We went into the other bedrooms and walked around. The bedroom across from the suite was so heavy feeling. My aunt went towards the “hallway” and went to look into the other rooms, but I could NOT get my body into that hallway! I stopped halfway in and watched my aunt peeking into the rooms. She got to the end of the hallway and bent over to peer into the staircase and a shadow went pass me – but I was looking right at my aunt’s shadow! Well, I freaked out and demanded we call it a night. The uneasy feeling never left me and when we went to bed, I was too scared to sleep. The final straw came when the piano began to play. I was done! My aunt gave me a Valium to help me sleep (yes, now I find these events very funny, but at the time, not so funny!). After that, I was out – head under the covers and asleep. My aunt says that during the night she awoke to someone “petting” her hair. She thought I was messing with her and turned over to find me completely out and turned the other way. She turned back over and said a few minutes later it happened again. She said she never felt scared and that it felt comforting to her. Mind you, this is a 55-year-old psychiatrist! Another Dining Room. Notice the mirror has the strange streaking that tended to show up in every picture that was taken that had a mirror in it. By Kathy Weiser-Alexander. The Lemp Mansion at night, by Kathy Weiser-Alexander. My name is Kristen, and I met Kathy Weiser of Legends of America on October 9th at the Lemp Mansion. 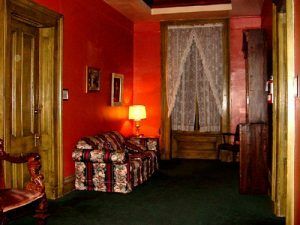 My husband and I were staying in the William Lemp Suite and joined the tour of the Lemp Mansion. Other than not being able to sleep until after 3 am (I was unbelievably hot, probably from adrenaline,) not too much happened. We took a tour of the house by ourselves after the staff left. There was definitely a feeling of being watched, although a big, old house like that, late at night – I guess it’s to be expected. I did, however, have four orbs show up in my photos. 1) On the grand staircase, 2) The basement bar-right below the stored wine bottles, 3) Our room – in the curtain (window overlooks main street), and 4) In Charles Lemp room-top right corner of the armoire. I was extremely skeptical about “orbs.” Taking the suggestion from a website, I looked through all of my personal photos from the past to see if maybe there were orbs that I had not noticed before. I found none. Now I have 4 on one roll of film. 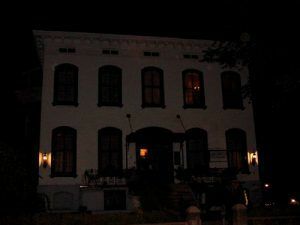 We recently visited the mystery play/Dinner and Bed & Breakfast at the Lemp Mansion. I am a 50 yr old male USAF Retired with a Master Degree in I.S. (Simply for credibility purposes). We enjoyed the play and food. However, will never go back for a nights stay. First of all, the breakfast had much to be desired. Second, we could not sleep due to an uneasy feeling of being watched. I had a bad dream and woke up several times during the night. My wife could not sleep either. We strongly believe we had a door to our room unlocked after we locked it when we came back from the shared bathroom down the hall. We also dropped two coins in a 10 X 10 open area and when we knelt down to pick them up they were gone. We looked throughout the entire area and under furniture that was several feet away and still could not find the coins. This was in William Lemp’s Bedroom. An interesting stay that we do not intend on repeating. 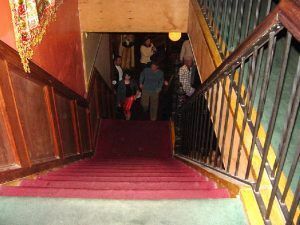 The staircase at the Lemp Mansion is said to be one of the three areas of ghostly activity. When you click on picture to view an enlarged version, you can clearly see several orbs at the top. 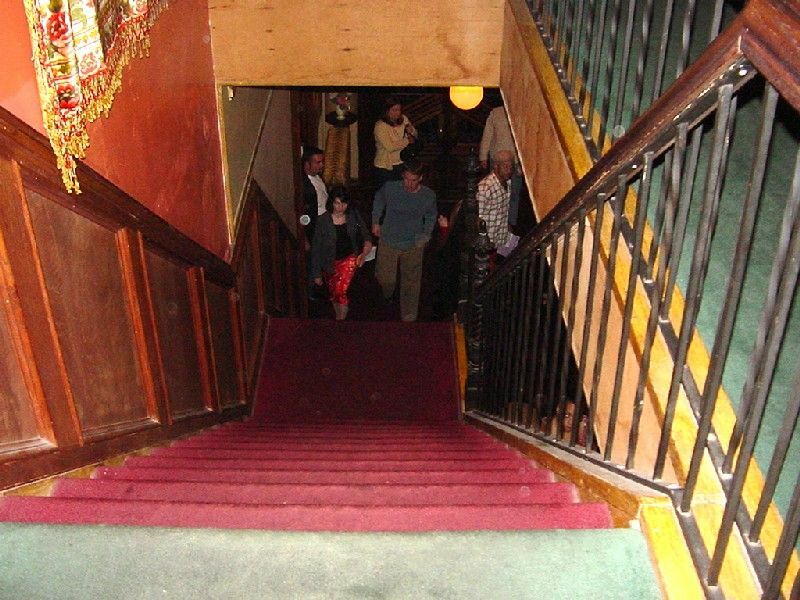 Even more creepy, see the little boy peaking through the banisters on the right side of the photograph. There were NO children with us that night. Moreover, that landing is more than 15 feet high!! By Kathy Weiser-Alexander. Its this window in the attic that people in the street office see the Monkey Face Boy peeking out of. By Kathy Weiser-Alexander. Editor’s Note: What is actually in the photo is a parking meter and a tree in the background. There is no man. We can’t explain what looks like a face. If the old lemp brewery is so scary and haunted then why was there no movies made about it. Also there is no real phonemon’s about this so called haunted Mansion. I would like to know more about this old Mansion. I’ve heard the stories but where is the proof. I was reading stories from visitors and looking at there pictures. A picture from Robin, August 2006 of the orbs in the attic. Just to the left of the orbs on the door frame. A little back from the door it looks like a person is there. I have had pictures that have orbs in them where the very next picture,almost identical, does not have orbs. interesting historic story and either a myth/ truth there was some sadness role play in the story?? ?